The judges join other high-level government officials to face U.S. sanctions. camera (AFP/Getty Images) Venezuelan opposition activists, one holding a sign which translates to "No Dictatorship" take part in a rally against the government of President Nicolas Maduro, in Caracas, on May 18, 2017. The Treasury Department has announced that it has sanctioned eight top Venezuelan government officials -- all members of the country's Supreme Court of Justice. "The Venezuelan people are suffering from a collapsing economy brought about by their government's mismanagement and corruption," Treasury Secretary Steve Mnuchin said in a statement. 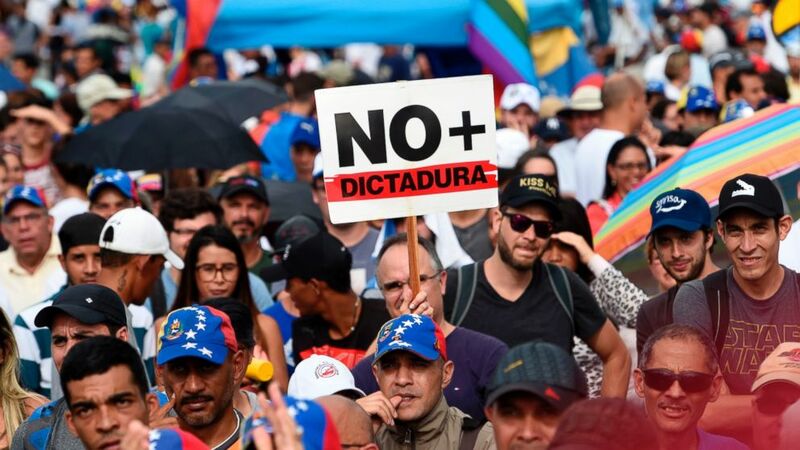 "By imposing these targeted sanctions, the United States is supporting the Venezuelan people in their efforts to protect and advance democratic governance in their country." The 32-judge Supreme Court has aided President Maduro in his consolidation of control by dissolving the democratically elected National Assembly and allowing the president to rule by executive authority. Venezuela's opposition party controls a majority of the Assembly but has been slowly weakened by Maduro since they won elections in 2015. Critics have said Maduro's bypassing of the country's legislative body represents a troubling turn toward autocratic rule. A senior administration official accused these eight judges of "contributing to the rupture of democratic norms." 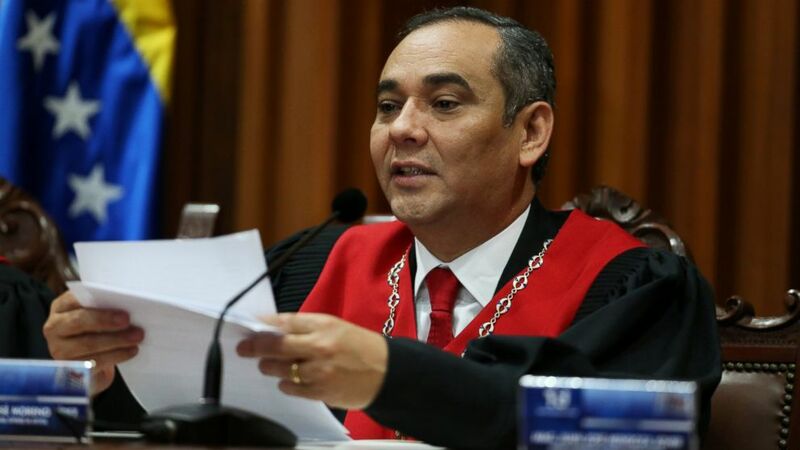 The list includes Maikel Moreno, the president of the Supreme Court, and the seven principal members of the court's Constitutional Chamber who wrote most of the decisions that have undermined the National Assembly, according to the Treasury Department. (Reuters) Venezuela's Supreme Court President Maikel Moreno, speaks during a news conference at the Supreme Court of Justice (TSJ) in Caracas, Venezuela April 1, 2017. In a press briefing earlier in the day, President Trump called the situation in Venezuela "a very, very horrible problem." "From a humanitarian standpoint, it is like nothing we’ve seen in quite a long time," Trump said, adding, "Right now what's happening is, really, a disgrace to humanity." Senator Ted Cruz was among the first U.S. lawmakers to react to news of the sanctions. Cruz said the judges "actively undermine democracy" in a tweet. Today's actions freeze any assets they may have in the U.S., bar any American citizens from doing business with them, bar them from entering the U.S. and add their names to an official Office of Foreign Assets Control list that discourages foreign banks from doing business with them as well. A senior administration official could not detail how much those frozen assets are worth, if anything. But they said the ultimate goal is to bring about a positive change in behavior and encourage these individuals to "change their ways and contribute to Venezuelan society." They added that the administration expects to take further actions in Venezuela, but declined to offer any details. "As President Trump has said, Venezuela is a disaster. It's basically an autocracy, and the people are suffering because of bad leadership and bad leadership alone," said another senior administration official. "President Trump has made clear that the U.S. will not tolerate bad actors that exist in Venezuela under President Maduro," they added. "Those folks should be on the lookout for further actions. More will come until they change their ways, just as the Venezuelan people expect them to and the constitution requires them to." In February, the Trump administration also slapped Venezuela's vice president with what are called kingpin sanctions, for his role in the alleged trafficking of illegal drugs. Venezuela has been rocked by protests as people take to the streets to protest the Maduro regime's power grab. The country faces severe hunger and a public health crisis, but the president has refused entry to any humanitarian aid. Like the U.S., several countries in the region have also expressed concern. The Organization of Americas States will hold an emergency ministerial meeting on May 31 to address the crisis.